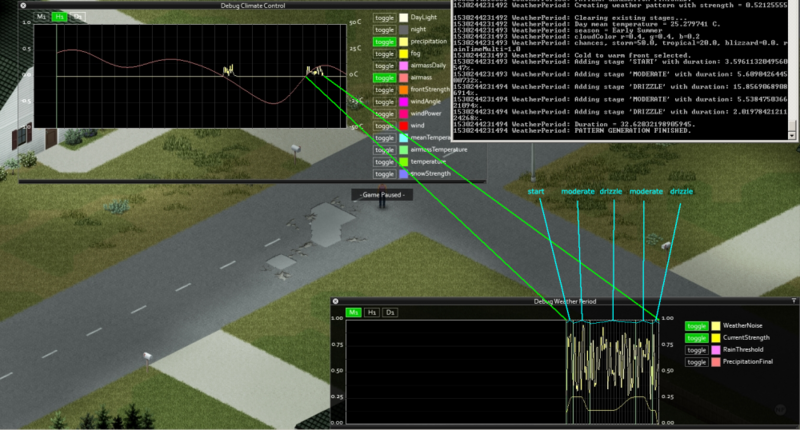 This week we’ve been connecting the wires on the improvements and features that didn’t make it into the initial vehicles release, but have hit a few MP snags that have prevented us from putting them out into a new IWBUMS beta today. Please note that MP functionality is not currently in-game, the debug windows described below are currently a system hog and you should not consider your savegame sacrosanct. This is a one-off beta that we’ll turn off once Weather is part of the usual IWBUMS testing process. Please put any/all feedback on bugs and your experiences playing with the build in this thread. 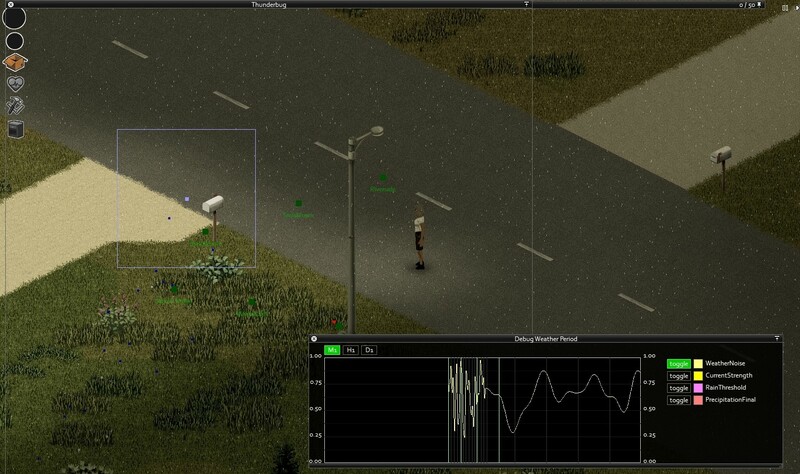 You can play PZ as you would normally, experiencing the weather as it occurs on a daily and monthly basis, but for this build (and this build only) we have also included Turbo’s debug panels – details of which can be found below. So what feedback will be helpful for Turbo to hear back on? The feeling of starting the game in different seasons, and surviving through each. Autumn will generally have higher chances of extreme weather, while late summer moving into autumn will also see a good chance of the generation of large/tropical storms. Winter clearly will see more snow. Player opinions on the new shaders that give a better feeling of the time of day, and the time of year. Any issues with rain/snow/fog appearing strangely when you are inside a building. 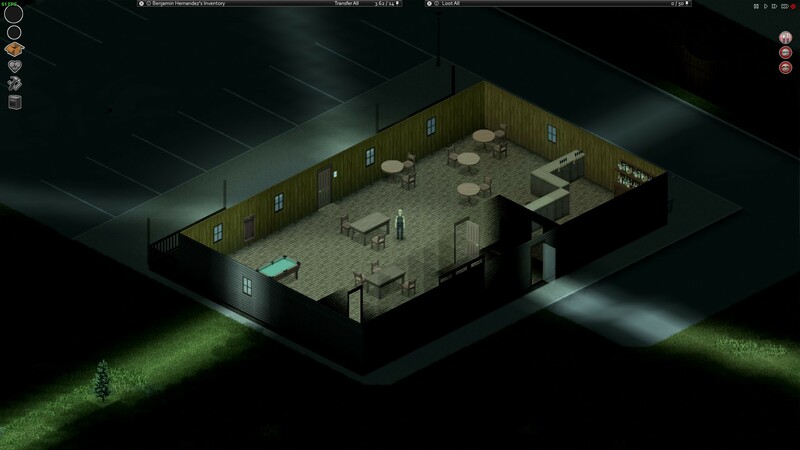 Any issues with rain/snow/fog around player-made buildings. 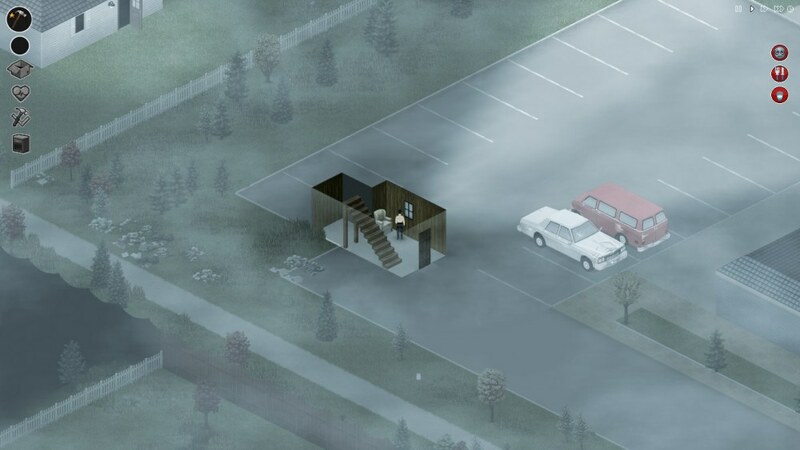 A player-constructed building with walls/doorframe/windowframe/fences should fully mask fog – and if it doesn’t then please provide a screenshot of your base. Please note that this is a 'realistic' climate system. Not every summer will be a scorcher, and not every winter will see snowfields. As mentioned, this is a debug build - so it also comes with a suite of (unoptimized) UI windows and functions for you to play around with. This is opened with SHIFT+BACKSPACE. Here you can play around with various values such as fog intensity, precipitation levels and precipitation type. Please note that to play around with these you will need to disable the ‘Climate’ manager or the simulated daily climate will overrule your changes. 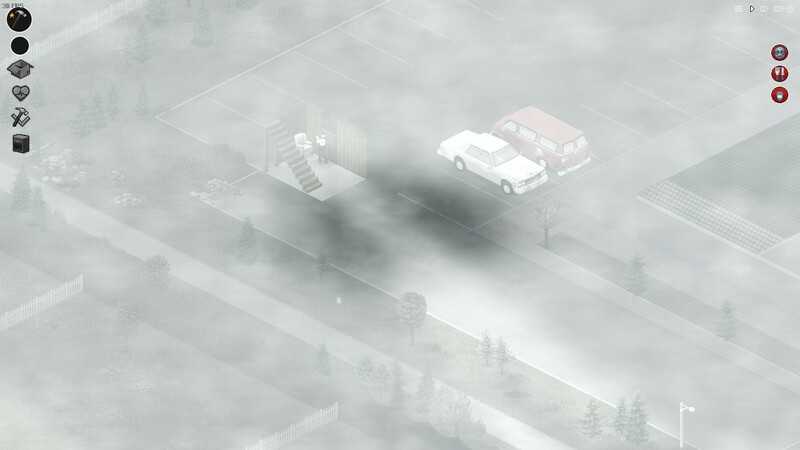 Please also note that fog enable through this method is for testing fog masking around buildings, and won’t look as good/varied as the fog generated by the virtual climate system – as it won’t take into account colour or desaturation. To see what values are running under the bonnet use the legend/panel on the right, and values turned on will be green. The panel below, meanwhile, displays additional info about seasons, cloud cover, etc. These panels are overall for the provision of information, but that said when you toggle "airMass" on, when it crosses the 0 middle line you will see weather generated when airmass switches from hot/cold. This is opened with SHIFT+MINUS, but is only useful if there is a storm active. A geographical indication of where the storm is over the PZ map can be seen, as well as lightning locations. 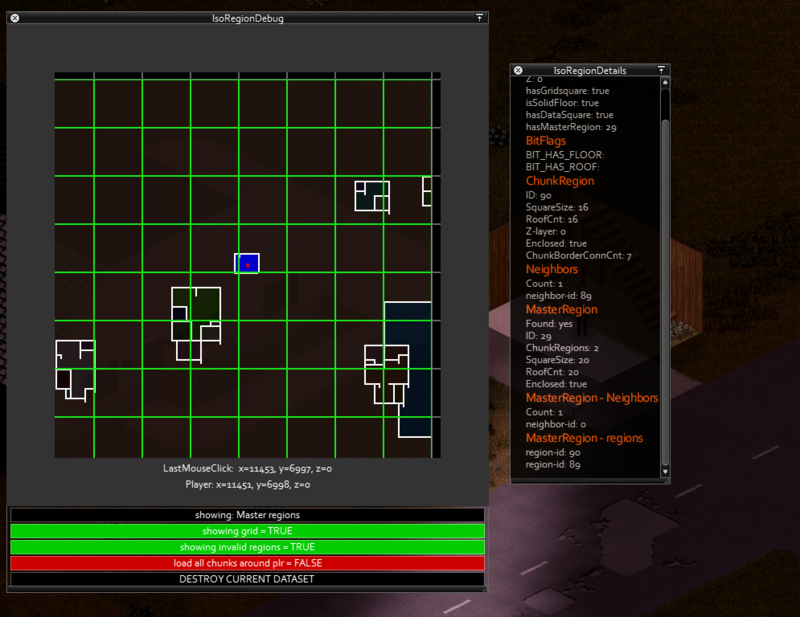 This is opened with SHIFT+0, and is being used by Turbo to detect when player-made buildings are fully closed off from the PZ map – and as such will allow fog/precipitation to surround structures, but not appear within them. PLEASE NOTE: this is a real performance hog, so may well slow down the game when turned on. I was literally holding my breath for this!!! - Overall, the experience seems to be very good! I had no problems with the shaders, although the morning shader could use a little more depth perhaps. After the fog evaporates, it makes everything feel too bleached. On the full moon nights, it would be nice if the shader was a little darker as well. 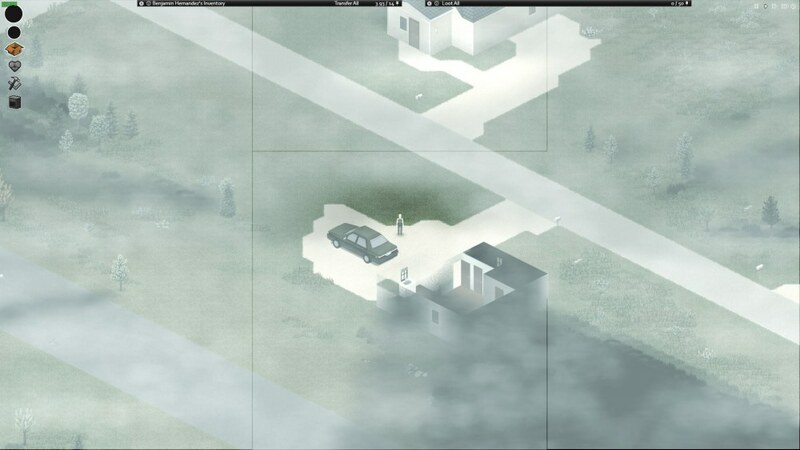 - In terms of rain/fog overlapping buildings, that system seems to be working nicely. 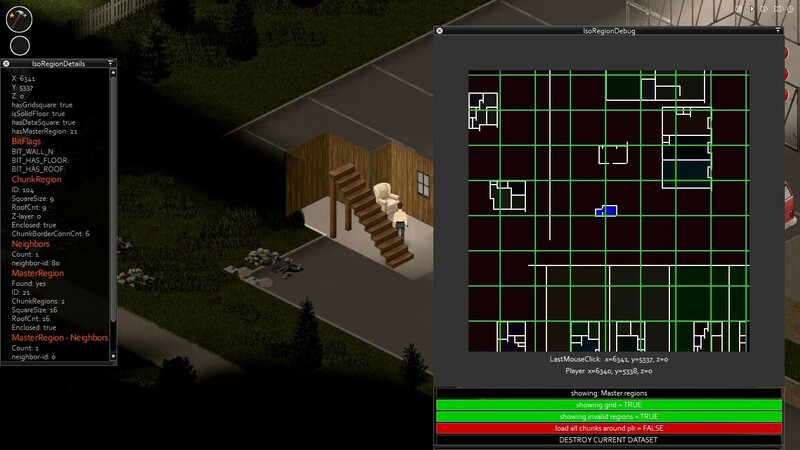 I tested it out in larger buildings and I did not see any overlap there. Something that I did not anticipate, but that was annoying is how fog/rain/snow overlaps any rooms that you are looking into through a window from outside the building (mainly when you are right up against the window). It makes it harder to discern what is inside a room which, from the character's perspective, has no snow/rain/fog. - One glaring bug that I did run into is that no matter the setting, the game starts with the power and water already off. 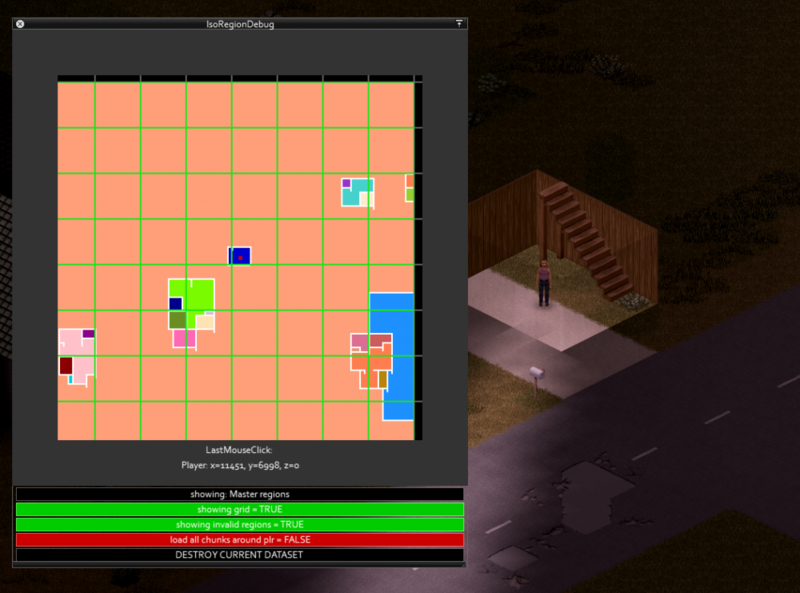 - Otherwise, however, I did not run into any gamebreaking bugs in my first hour. My props to Turbo, this all looks amazing! - Game experience is much better for me now. With new shaders combined with snow and other new or improved weather effects the game finally looks like it really has different seasons. 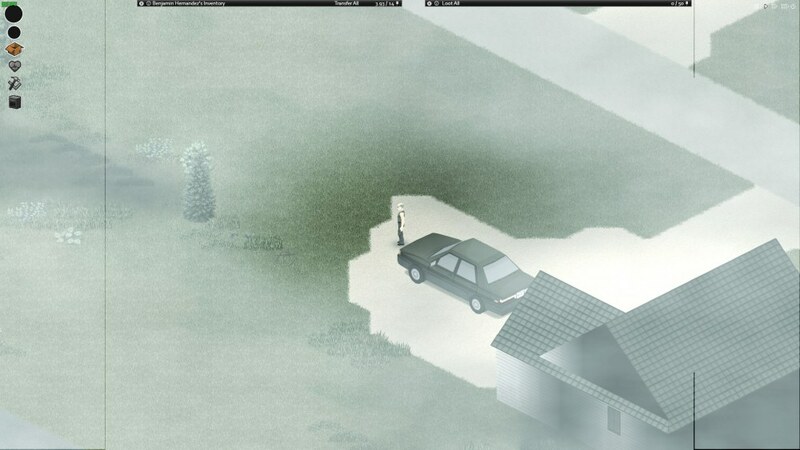 Fog, as I understand, can become a serious trouble to the player, and falling snow looks really amazing! PZ runs little slower now, but still enough for comfortable game. About general and serious bugs- there is much quiter sound when I open or close doors and windows compared with stable build. 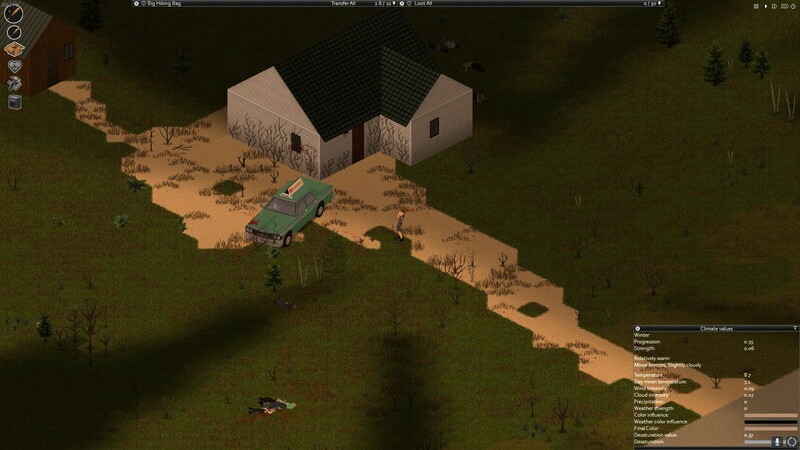 Don't find any problems with zombies, loot spawn or cars at this moment. 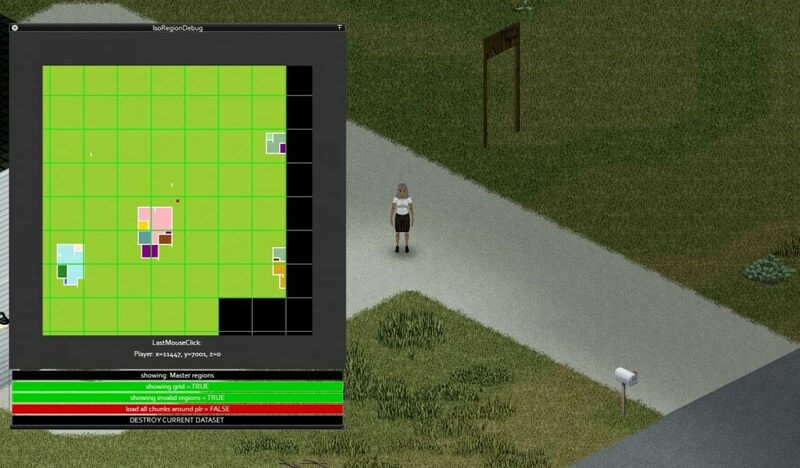 - Don't play enough, but can say that in January is still pretty warm even with "cold" and "very rainy" sandbox settings. I survived from 10 to 21 day in sweater and didn't get hypotermia. As I can see, weather is more unpredictable now, usually in 10 January it was already fallen snow, now snow falling around 2 days in 17-19 days. Also tried to play a bit in April, July, August and October in various weather settings, but don't find storms yet. Fog is common at least in July and January. - I absolute appreciate this work, especially evening and night shaders in all seasons. It's look just amazing, and now nights look even more terrifying than before! - No problems with that for me. Rain, fog, snow displayed correctly from any point of view. Fallen snow combined with fog also displayed correctly. I am probably going to end up testing the build more if I have time, but right away as I started a new game, I encounter a bug that can get annoying when it gets foggy. There appears to be black lines that get on screen and fade away as the fog goes away aswell. If you zoom in, you can still see the lines up to a point, so playing zoomed out is not good. Also, I am not sure if this is intended but, is the interior lighting supposed to be almost the same as the outside one? When turning on the lights it looks the same, and at night, it just seems as if there were no lights. The only thing bad I've noticed so far is the change from night to day and day to night is very... quick? I mean, it's not gradually changing. It's more like preset 1 morning, preset 2, afternoon, preset 3, dark evening, preset 4, completely dark. I presume that's not how it's supposed to work. In Sandbox, messing with settings and have the date set to December in the settings. I'll mess around some more, sometimes bugs happen once and never again for me with new branches. It seems the Linux build is not starting? I'm getting the following error, indicating a file is missing. I see the files is its usual location, so it seems you accidentially missed dot in .local? Small QoL: Turn that storm world map 90 degrees anti clockwise and it will be perfect. Weather looks nice, I just don't know how long it "takes effect" when we control it. My character doesn't get wet under the rain, ground isn't covered with snow and so on. In my honest opinion, heavy snowfall should be accompanied by heavy fog. I've tested this setting, it looks just so nice. Just look at it. It's PERFECT. It made the entire heavy snowfall look so nice and actually dangerous to drive in. 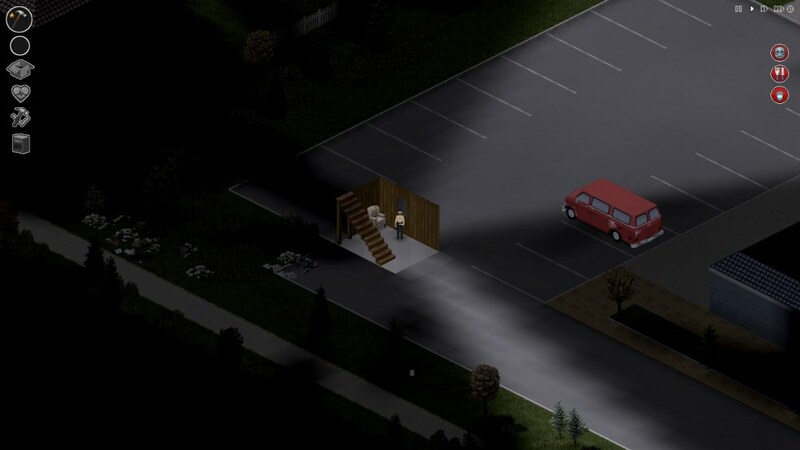 When heavy fog hits the night (as I've simulated), map gets brighter as if it's a day.. Fog should make night pitch black, almost impossible to see. It does look really good, but is maybe most appropriate for blizzards or windy winter days (which can create whiteouts). I think regular snowfall is appropriate as-is. Ey all, thanks for the feedback so far and giving the build a go! Some interesting points for us to look into have already been raised, also might do a quick fix later on for some of the issues like the black lines in fog and the linux thing. It seems temperature might need some testing to see if it feels alright for the seasons, also on the different sandbox settings. Tho as mentioned in the main post this can be subject to psuedorandomization. This value is derived from a summer and winter peak temperature value, those peak values can differ per year depending on the summer and winter strength. The mean gradually changes from high to low and serves as a basevalue for temperature. This is the actual temperate (also displayed in the smaller info panel) as you can see it goes up and down like a zigzag between day and night, it also has other influences as the pattern doesnt follow the mean exactly. One of the influences is the airmass temperature. This is not a celcius value like the other two above, but a value between 1.0 and -1.0 instead. Depending on its strength it can push up or down the temperature with several degrees up to 8 or so. The airmass temperature lags a little behind the airmass value itself, so drops and rises in temperature usually coincide with changes in fronts. If its summer and a very strong cold front is generated for example the temperature can be quite low relativly speaking (these fronts can take some days up to some weeks to change). does the building have sufficient walls? i notice no wall on the end of the stairs side altho that could be a visual occlusion by the game. does the building have sufficient roofing? all squares should have a roof tile, unless tiles with a stairs for those roofing can be ignored. if those are all good, could you perhaps check if the building gets properly recognized with the SHIFT-0 debugger? The "Master region" should display some info square count and roofs counted, which may have some indication on a possible error. @MadDan2013 the transition is supposed to be gradual, please give a shout if the problem persists. a vid or some screenshots from moment to another would be handy if possible. 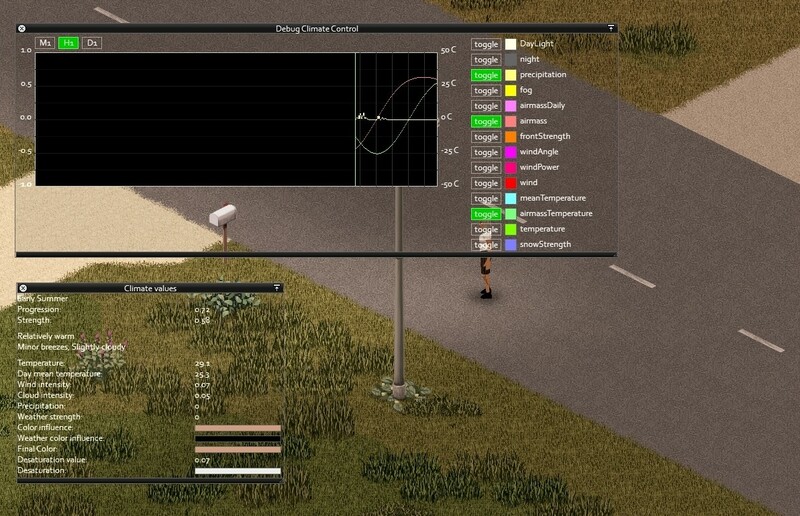 @Soul Filcher Filcher when taking control of weather via Fx panel by disabling the climate manager no sub effect (like snow on ground etc) will take place since the climate manager takes care of that. you only have direct control over the values on the panel. @Eggtooth (and @trombonaught) agreed, in fact the system actually should do that already when the weather pattern is a blizzard and its intensity is on the high end it should throw in some fog. The fog indeed doesnt play well with the dark of night, however atm normal fog that is generated by the system only appears in the early morning and gets burned away by the sun around midday'ish. Best is to select the fastest time elapsing setting when creating a game, then use the FX panel to turn on god mode and fast forward untill weather shows up. But also on wether the last front was warm or cold. If the last front was cold its usually less intense and pretty plain, lower wind power and cloud thickness, moderate rain and drizzle periods and such. If the last front was warm, it gets more interesting depending on the frontstrength, allot more windpower, shifting winds, thick clouds and darkness, showers of rain and more rain in general, chance on thunder clouds or tropical storms. 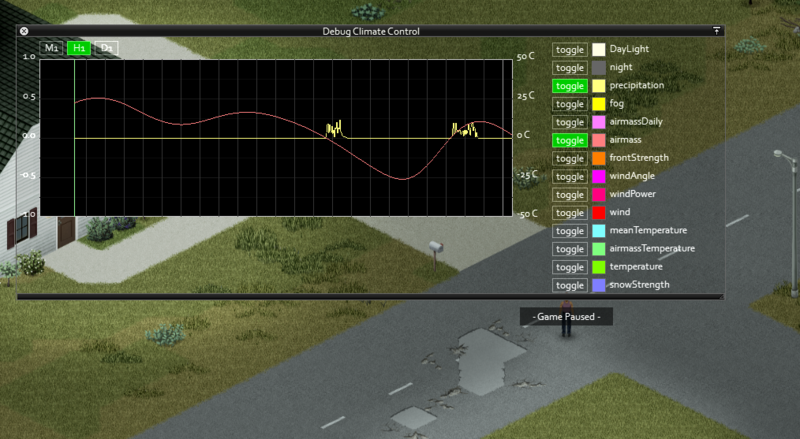 If you have the weather period debugger open (best to open before the weather period starts not to miss plotpoints) as well you can see the different periods seperated by a brighter line. 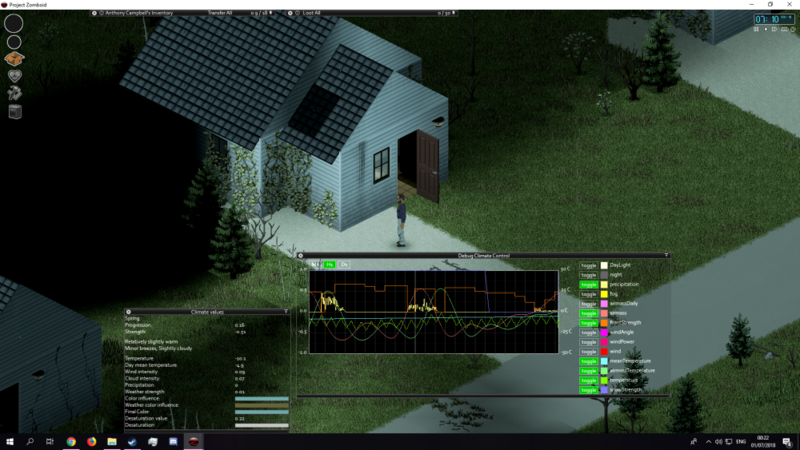 NOTE ive accidentally toggled weathernoise on in the weather period debug which is just a random noise, i was meant to toggle PrecipitationFinal instead wich resembles the precipitation in the main climate debug. To the right the front strength had build up quite high and then the airmass started dropping, if the airmass had dropped but stayed above 0 the front strength would have gradually declined. but in this case it dropped steeply to below zero without giving the build up strength time to decrease causing quite a powerfull weather period to be unleashed. Great feedback everyone, keep it coming! So far, the only problem I noticed is a drop on framerate, not so much, but still noticeable. But I have to admit that I love the variation the weather adds to the game. Also, something that I noticed too is that the Winter is Coming scenario has a normal weather pattern, with no snow or temperature change to be seen. I don't know if this is on purpose or it has still not be worked on , but will it be changed? And also I got new bug- when I quit from game, fog disappears. Yesterday I quit from game when stayed inside my unfinished hideout and today I discovered that fog around me is gone ( just now got the same bug when quit in main menu and load my save 3 times) and even 3 planks on my window frame disappeared too. and the game works now. I suspect there's a simple accidental problem in the Linux .sh script, but I'll take a look at it and compare with the 39.67.5 script later. I noticed temperature doesn't really change, even when I'm not controlling it, at least not comparing with other builds. I tested at least 3 or 4 days in the coldest sandbox option, and during the whole time temperature was exactly 0c. The cloud effect becomes a little choppy when driving fast down the street, switching between cloudy and totally clear until it loads it seems, then it goes that again. Great work so far! I had some car crashes because I couldn't see anything in heavy fog! I've been experiencing this everytime I see fog. This is an amazing update that adds a surprising amount to the game. Don't know if you're taking suggestions or I'll put them on the suggestions forum, but are leaves for autumn planned or possible to add? They'd be pretty sweet and add to the atmosphere a bit more. 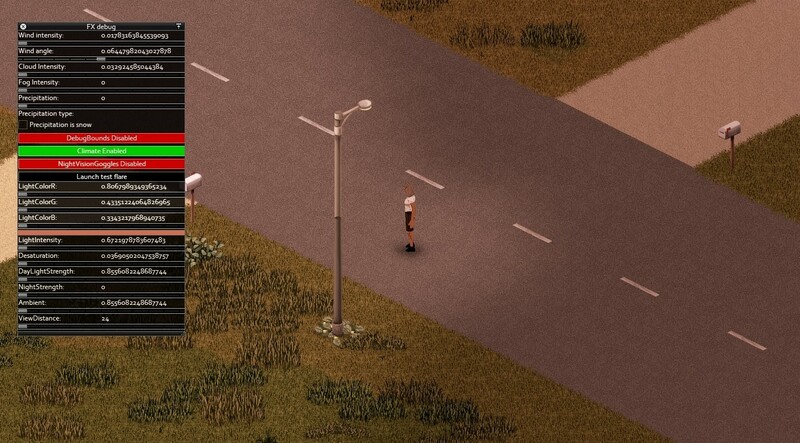 Also another thing I noticed that should work, is that the car headlights don't allow for clearer visibility during fog, as in real life, you can set it the lights to low beam and high beam depending on the thickness of the fog, though I don't think you should go as far as to putting 3 settings for headlight conditions. Atleast being able to see better with them on should be a thing. 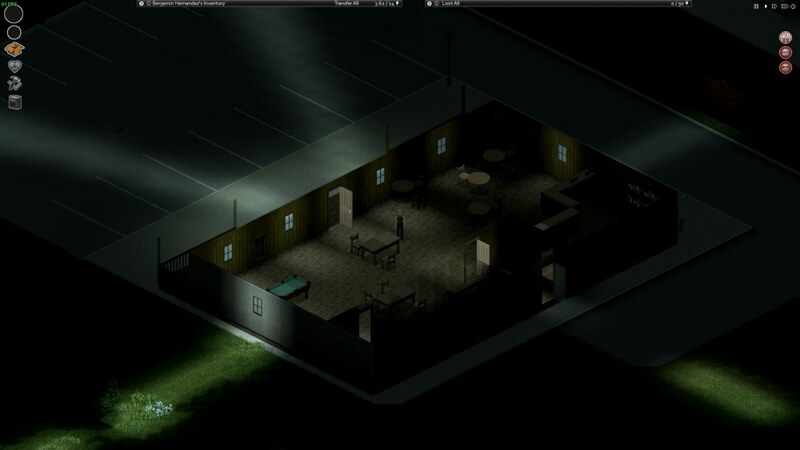 The new shaders can also mess the lighting brightness at night (as I previously reported). I am guessing this is all unintentional and is being worked on of course. So I don't know if this is on purpose, but looks like that when the game reaches 8th of March, even if temperatures are below freezing, snow will melt almost instantly. I'm playing with the very cold and very wet settings on sandbox. You can notice on the image when the 8th of March starts. I barely had time to play, but does new weather currently have any functional difference, other than maybe temperature? So far I don't think the snow or heavy wind makes any difference on using vehicles or even walking, but is anything like that planned for this build or somewhere later down the road? I also tried to track the lightnings but other than the cool visual effect, I don't think you can be struck by a lightning or can it cause fires, but is anything like that planned as well? I also noticed that you can change visibility in debug options, so other than the visual obscurity by the cloud fog, does that mean your character seeing range (i.e. actually seeing zombies) decrese as well? And what about the hearing range? I suspect a heavy blizzard, rain or thunderstorm could make it harder to hear. Also +1 to the anti-fog effect on the lights as @Capt.Motty suggested – I also posted it in the Small Suggestions thread before :). Not on topic, but also not off-topic since it happened when playing this version. 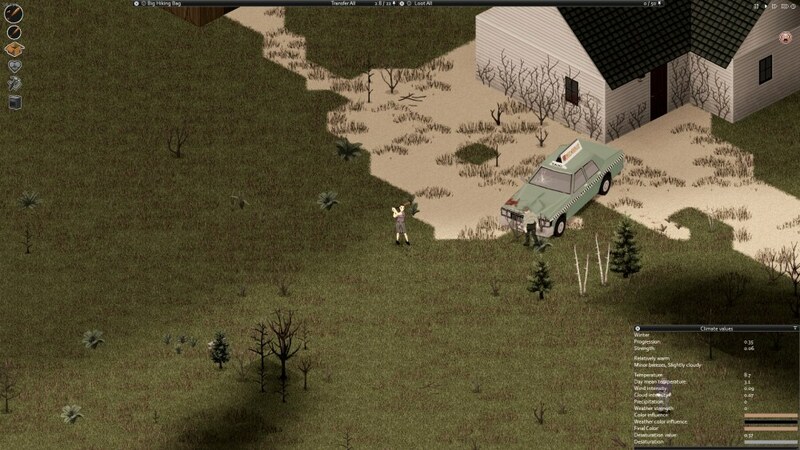 I had a null-pointer exception when the game tried to spawn a random car in a road crash near Riverside. Got kicked out of the game, loaded back in, my car was gone, then I walked in the direction I was going and got the same error and kicked again. In terms of its feeling overall, it feels great. With shaders off, it seems to look the best, look the most natural. Though with shaders on sometimes it's very grayscale, feels very empty. I understand the shaders make the game moodier, and I often play with them on but I feel it needs a bit of toning down. Maybe it's just me? I like playing with shaders on naturally, but with them off, you can very easily determine the rough time of day without a watch. Having shaders off suits the update much more, and definitely looks amazing but I feel some changes need to be made for them when they're on.